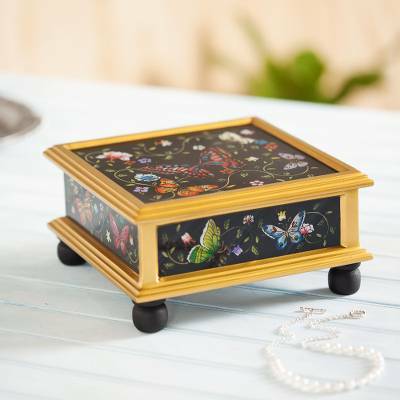 Elegant butterflies explore a lush floral garden against a black background on this decorative box. Asunta Pelaez paints the beautiful motifs by hand on the inside of glass panes. The box opens to reveal a sleek back interior. You can find reverse-painted glass decorative box 'Midnight Garden' by Asunta Pelaez in decor accessories categories such as Animal Themed Decorative Boxes, Floral Decorative Boxes, Hand Painted Decorative Boxes, Reverse Painted Glass Decorative Boxes, Nat Geo Decor Decorative Boxes, Nat Geo Decorative Boxes, Glass Decorative Boxes and Wood Decorative Boxes. Enjoy exploring these sections for other Novica treasures.